Setting on a knoll in the middle of 5 private acres, you will feel like you are out in the middle of the woods, yet at this location you're actually in the "center of it all". Just a short drive East and you find yourself in the heart of Sequim. Sequim offers great local restaurants, shopping and coffeehouses. Tour the Lavender fields that dot the countryside or take a long walk on the beach at the Dungeness Spit and visit the historic Dungeness Lighthouse. An even shorter drive West will take you into Port Angeles and the first entrance to the Olympic National Park at Hurricane Ridge. Many more great local restaurants and pubs can be found in Port Angeles's eclectic downtown area. Easy day trips to Lake Crescent, Sol Duc Hot Springs and the Hoh Rainforest as well as the Pacific coastal beaches can be experienced from the home. You can even bike on the Olympic Discovery Trail, accessed less than a 1/4 mile from the home, both into Port Angeles or through the countryside into Sequim. Back at the Casa, relax in the steam sauna, or just sit outside on one of two decks to enjoy the peace and solitude. The home is extremely comfortable and inviting with two bedrooms, great living space, fully equipped kitchen for preparing meals and plenty of room to take walks and discover the playful hidden yard art the owner has placed throughout the property. In season, hundreds of tree frogs will come out at night to lull you to sleep. The Casa is a perfect getaway for a family of 4 or two couples traveling together, but there is a sofa bed available that can accommodate a 5th guest if needed. We love dogs at the Casa and welcome your pet with you on your vacation. Come and enjoy the peace and solitude found at the Casa de la Rana. Propane BBQ, seasonal use May-Oct.
Our initial rental suddenly became unavailable a week before our trip. The team reached out and we were were able to find a replacement property the same day. I appreciate their efforts to help us. Had such easy experience with the reservation and communication was very clear. We mostly used the space for sleeping. We were out most of the day hiking, and when we came back it was great to have a hot shower and we were able to wash our clothes. We enjoyed the location and the privacy. The cottage is located in a very quiet area and was close to grocery stores and lavender farms. The cottage is located about the same distance from Port Angeles and Sequim. Olympic National Park is only a few short miles from the cabin. We saw three buck deer feeding in the front yard one afternoon. The kitchen is equipped with any cookware that you might need to prepare a full meal. The cleanliness of the cabin was excellent. The washer and dryer was a nice addition. We were two couples so two bedrooms and one bathroom worked well for us. The front porch was always a nice place to set and enjoy nature and a cool breeze. AT&T cell phone service was very good at this location. We would stay at the Casa de la Rana aka House of the Frogs if we get to this area again. Frog Log: Day 1: We enjoyed the quiet of the house and peacefulness of the yard. We came from Cashmere, WA to see the rainforest. Day 2: Today we hiked in the Hoh Rain forest and it truly lived up to its name as we were soaked. We headed to Sol Duc Falls for a little drier walk. Beautiful. Day 3: Visited Marymere Falls, better than Sol duc and less crowded. also went to Hurricane Ridge and enjoyed the view. Topped off with lunch at the Oak Table Cafe in Sequim--Don't Miss It!! Thank you for having us. Owner/property manager was wonderful to work with and VERY accommodating. Stayed here with my 2 young children and had a fantastic time. Very comfortable, quiet, private and clean. Kids had a blast running around the yard. Home is fully stocked with everything you need for a short or long term stay. 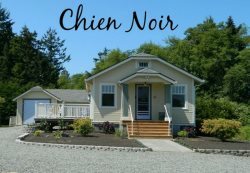 Excellent location between Sequim & Port Angeles. Have recommended this place to friends already. We have spent the last two years celebrating Christmas with local relatives at Casa de La Rana. It is a perfect retreat for us and our dogs. We appreciate the upgrading to the house over the past year. Thanks you and hopefully we'll be back next Christmas! We have so loved our experience here in the Casa de la Rana! We sincerely wish that we never have to leave! We have had so much fun exploring our surroundings of this beautiful place. We loved visiting Port Angeles, we even took a scenic drive up to Bainbridge and ferried over to Seattle for the day. The sauna was delightfully relaxing. Thank you for a lovely weekend! The sauna was a great addition to have in the cooler temperatures. Great location close to shopping and site seeing and yet secluded enough to have some peace. Please note that the nightly rates on this property are based on 2 guests; an Additional Nightly Guest Fee is added for each additional guest up to 5 guests max. This is a pet friendly property; please inquire with weight and breed of your dog for consideration. Additional Nightly Pet Fee added to reservation.